The charm of Japan for overseas will be the natural scenery changing by each season. Many foreigners visit many times a year to enjoy the beautiful scenery of each season. Kyoto has become a leading sightseeing spot in Japan, is also working innovatively on inbound, and the foreigner rate of lodging users is rising. Spring season in Kyoto, as a land of longing from abroad, tourists from various countries will come to experience "The Japan". Kyoto, the proportion occupied by foreign tourists visiting Japan continues to increase year by year. The inbound ratio, which was 28.9% in 2014, increased by more than 10 points in 2017. Along with the growing number of visiting foreign tourists visiting Japan, we can see that the demand for inbound accommodation in Kyoto, a popular tourist destination, is rising. The initiatives to disseminate Japanese culture to the world will begin before the Tokyo Olympic and Paralympic Games to be held in 2020.As an international tourism city, Kyoto is expected to play a role as a driving force for spreading Japanese culture.I will introduce the popular spots in Kyoto which is popular with foreign travelers. Many overseas travelers are seeking landscapes symbolizing Japan. Japanese cherry blossoms attract foreigners overwhelmingly. Regarding Japanese cherry blossoms, the information crosses national borders at SNS. "Keage Incline" is also famous as a cherry blossom spot. There are 90 Yoshino cherry trees planted along the railroad track, and we will make a splendid cherry arch like surrounding the railroad track. It is only here in Japan that you can appreciate cherry blossoms while walking in the track. It is a 3-minute walk from Keage station, subway Tozai line. "Keage Incline" is a slope railway trace of 582 m in length near "Higashiyama Nanzenji". "Keage Incline" is also often used at shooting places such as wedding photos. Even when I visited at 6 o'clock early in the morning, I saw a groom, a bride, decorated with kimono. A unique Japanese scene called waste line, cherry blossom, kimono and umbrella attached many tourest's eyes. There is "Suirokaku" in the precincts of Nanzen-ji Temple in the waterway which was made to carry water of Lake Biwa to Kyoto. It is said that it was designed in reference to Waterway of the ancient Roman age. "Suirokaku" is a wonderful atmosphere with the retro form of British arch bridge piers and the texture of brick blended into the surrounding nature designed with reference to the Aqueduct of Ancient Rome. Length 93.2 meters (4 meters wide, 9 meters high) Brick, granite-made, stately bridge piers, designed to not hurt the landscape and blend into the historic Nanzenji. The arch continues beautifully and decaying landscapes are distinctive, reminiscent of some old European architectureIt has been used as a location for a number of dramas, commercials and animations, and has a style that drifts in style and has added flowers to the work. Fushimi Inari Taisha, located in southeast Kyoto, is the head shrine of about 30,000 Inari shrines across Japan, with a compound of 870,000square meters. Originally built by the Hata family in 711 to enshrine the deity of rice, it is now believed to bring good business to worshippers as well. This shrine is renowned especially for its stone fox statues in pairs as well as thousands of closelyspaced vermillion torii gates lined up along the pathway to Mt. Inari, each of which bear the name of its donor. The place where Fushimi-Inari Taisha's Senbon torii is located is at the entrance of Inari Shrine, which is a theological body. Inari mountain is a sacred place which is also said to be the land of the descent. Many torii were built as a boundary that connects from the human world to the world where God exists. These torii are said to have been built from the Edo period to the Meiji era. It is said that the number of torii of Inari mountaion as a whole is about 10,000 or more. Tourists from abroad tend to take pictures as soon as they find "torii". Recently, many overseas travelers shoot the torii behind the torii rather than shooting the torii from the front. Because the name and date of dedicated person is written in Kanji and it is attracted to "Torii with Kanji". Speaking of the impressive landscape of Arashiyama, it is a small bamboo forest with a length of about 400 m that leads from the Nomiya shrine to the "Okochi Sanso garden" through the north side of the world heritage "Tenryu-ji". "Arashiyama Bamboo Grove"is an impressive landscape like Japan, "Arashiyama Bamboo Grove" was taken up in overseas media and it has become a big topic. From the myriad of bamboo stretching straight upwards, there are many visitors who felt Japanese ancient aesthetic sense and taste and were captivated by the magnificent landscape. Surrounded by "Koshibagaki" on both sides of the road and surrounded by a blue bamboo stretched straight ahead, it is the most beautiful and famous place in the "Sagano" area where beautiful bamboo groves spread. 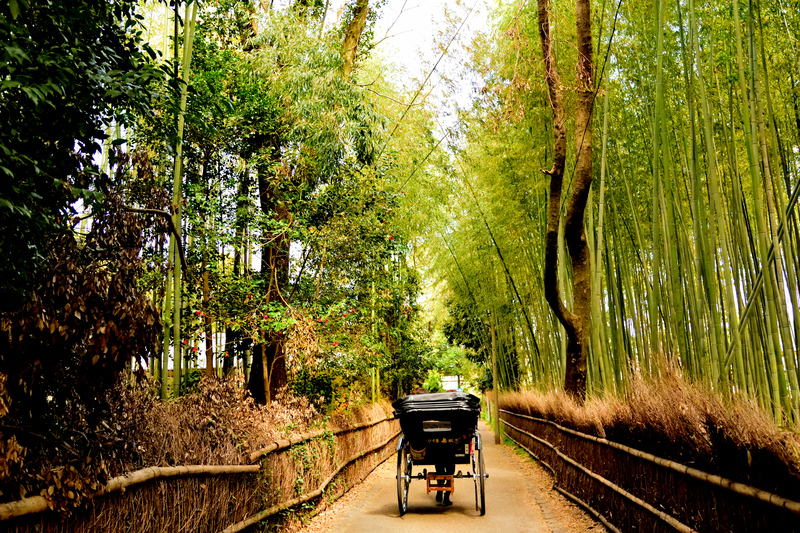 "Arashiyama bamboo grove" is one of the most popular spots representing Arashiyama sightseeing where many touristsrush. Often it is decorating covers such as posters, travel magazines, guide books, etc. Also frequently appearing on TV commercials and dramas, it is also used as the cover page of the English version guide book "Lonely Planet Japan" . As the whole is covered with bamboo groves, "Arashiyama bamboo grove" keep the space of silence dims and dim even during the day. I was able to stroll comfortably by taking the sun through the sun filled through the bamboo grove. Not only the shrines and temples but also the tasteful "Roji (alley)" is one of the charms of Kyoto. After the ladies who came kimono worshiped at "Yasaka Shrine", they took a rickshaw and she felt the wind and light of Kyoto. The sight of a woman in kimono going down the street of Kyoto with a rickshaw is similar to the ancient capital of a thousand years, I will stop and look at it. 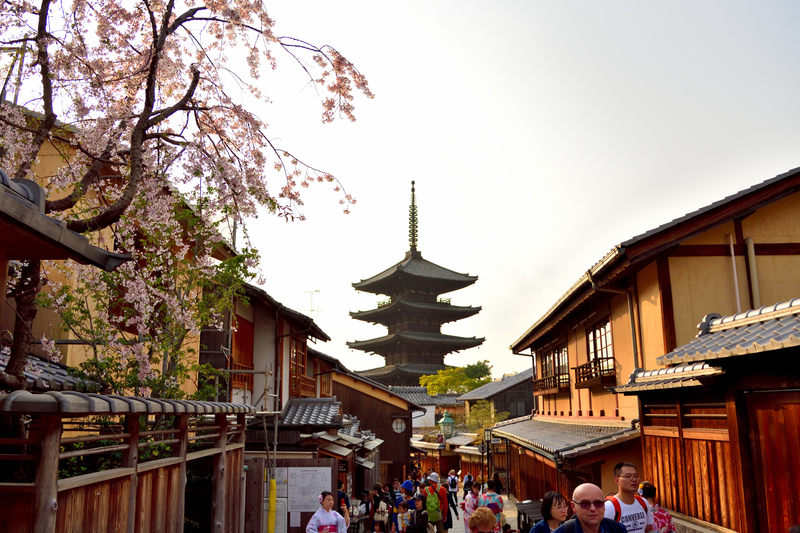 It is popular that foreign travelers wear kimonos and walk around "shopping streets of" Gion "and" Hanami Koji ". Speaking of Gion, "Hanami Koji" is the main street, but once you step into "Roji (alley)", there is a beautiful stone pavement with "Kyomachiya" (traditional old townhouses in Kyoto)From the hustle and bustle of "Hanami Koji" which I have been walking, it will be a quiet space. You can feel the feeling of Kyoto carefully with your skin and eyes on a very quiet space. After sunset, the lights are lit up in the lanterns of each restaurant, making it a fantastic atmosphere! When you visit on weekdays, you may encounter the scene that "Maiko-san" or "Geiko" is going to each restaurant to quickly show the traditional japanese dance. We will not be able to feel such a taste in the other streets of Gion's path. If you want to feel the current Kyoto, I recommend “Hanaki-koji”. When you hope to seek the taste of Edo period, I recommend a way to the “Roji (alley)”.